The tree of life or world tree, is a creative symbol of manifestation in many cultures. Known as the ultimate gateway to the knowledge of oneself and the true nature of reality. Upon the awakening of the serpent energy or naas, the “moist essence of the universe” in the Gnostic view, also known as a kundalini awakening. The serpent energy coiled at the base of spine makes its ascend upwards into the brain and ignites all of the pathways, as the synapses begin firing wildly. This activation serves as the initial link between the metaphysical and physical reality of existence. Allowing the seeker to acquire his first evolutionary step into heightened awareness. This tree of life, allows the initiate to travel between the three worlds as depicted in shamanic practice. Establishing the connection needed to exist between physical and non physical reality. When this bridge is formed the seeker connects with the lower and higher dimensional beings, as well as animal spirit totems. Yet, this is just one of five trees of life, and the secret of the five trees is what we are here to talk about today. A parallel to this teaching can be found in Hindu tradition, where the five trees are known as mandara, parikata, samtanaka, haricandana and kalpa vrksa. As well as in the Kaballalistic interpretation of the five worlds and the five senses known as Asiyah, Yetzirah, Beriah, Atzilut & Adam Kadmon describing the five dimensional levels, as it relates to the souls progression towards unity consciousness. tree of life11Expressed as a large ash, oak or bodhi, the tree of life is found at the center of earths three worlds. Used as a passageway between the three dimensional levels of consciousness that earth serves. The world tree signifies the initiates attainment of the first of five senses being vision and will be accompanied by prophetic dreams and visions of the future. Expressed as a large pink coral, the bottom of the tree is brass or copper and is used as a portal through the fifth dimension, where beings who exist on this level travel are seen by portal openings just as doorways… with no door. The fifth dimensional tree signifies the initiates attainment of hearing and is accompanied by bouts of telepathic communication. This tree serves as the clearing and re-connecting of the nervous system. Expressed as a large flowing tree, alike to a white weeping willow; repressed memories of life before incarnation surge forward into your waking consciousness. The third tree of life signifies the initiates attainment of smell and is accompanied by the smell of flowers in waking state, with no apparent source. Upon reaching this fourth tree, the seeker experiences what is known as the elixir of immortality, or the ‘nectar of the gods’. This sweet tasting honey is produced and drips down the back of the throat giving one the experience of timelessness. Restoring the initiate to pristine physical health. The fourth tree signifies the attainment of taste. leonardoKnown only as myth and legend, this tree of life signifying the piercing through and connecting physically and metaphysically to the “gods above”. The effects are currently unknown but can be speculated as the unification of mind, body, soul, spirit to eternal life. The fifth tree signifies the initiates attainment of touch. 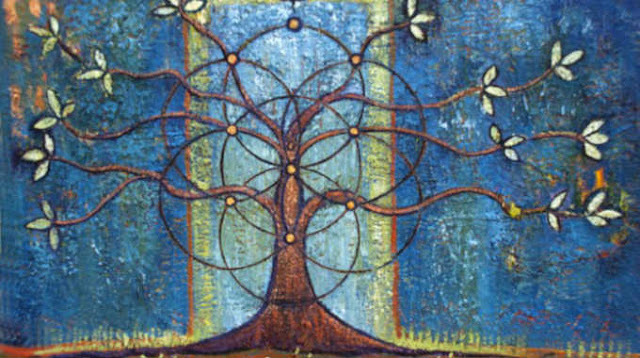 As each tree of life unfolds in your mind, you begin to see that all is connected and that the mind is the center of consciousness. While yet not proven scientifically, there is surmounting evidence that the center of the universe is consciousness itself. When you connect your body, mind and spirit to this eternal consciousness, you can then finally see why it has always been said that “everything you need is already within you”.